Our whole world revolves around the sun, both literally and figuratively. It promotes the growth of the food we eat, provides a timeline by which we order our days, and gives us physical light, which greatly aids in vision. Although we rely on the sun to meet some of our most vital needs, the constituents of its emissions can be more harmful than helpful. Sunlight is made up of two types of ultraviolet light that cause damage to the skin with overexposure. 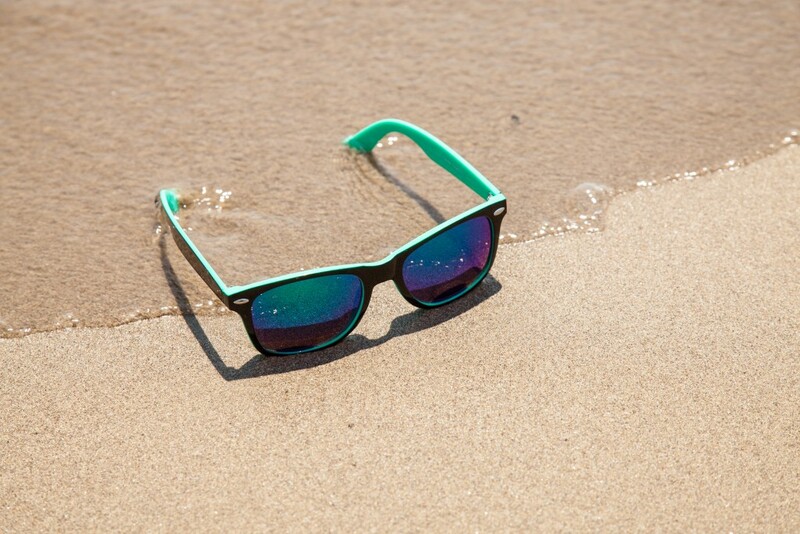 Both UVA and UVB radiation can produce fairly immediate effects like sunburn and freckling, but they also contribute to serious, long term effects like cataracts and skin cancer. In order to prevent the negative effects of sun exposure, we need to examine the specific characteristics of both UVA and UVB radiation. This begins with understanding light emission. Light, the sun’s form of energy, exists on a broad spectrum of wavelengths. We have organized these wavelengths into the electromagnetic spectrum with the categories of visible light, infrared radiation, which is felt as heat, and ultraviolet radiation, which cannot be seen or felt. UV radiation has the shortest wavelength of the three categories and therefore has the highest energy. That connection can be explained by first finding the frequency (v) of the light, then multiplying that by a figure called Planck’s constant (h). When the math is all said and done, we find that as frequency increases and wavelength decreases, the energy increases. UVA wavelengths fall between 320 – 400 nm and are not absorbed by the ozone layer. They are less powerful than UVB, but can penetrate deeper into the skin, even as far as the subcutaneous layer. This means that although sunburn may not occur, UVA contributes heavily to long-term damage of the skin and eyes, even in small doses. 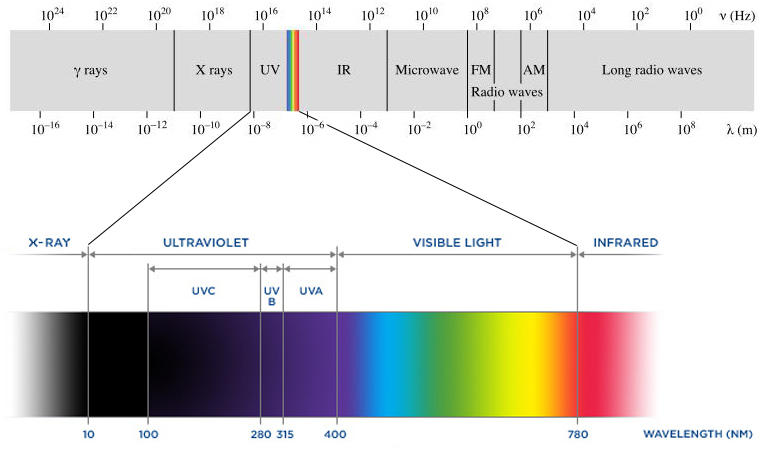 UVB wavelengths fall between 280 ─ 320 nm on the electromagnetic spectrum, meaning that they have more energy and cause greater damage at a faster rate than UVA. UVB has an altering effect on the actual DNA of skin cells, making it the main cause of sunburn and skin cancer. Most UVB rays are absorbed by the ozone layer, but enough reach the earth’s surface to produce serious health issues and strain on the environment. Unlike UVA radiation, UVB fluctuates in intensity based on season and elevation, both related to the proximity of a specific region to the sun. Scientists have also identified a third type of UV radiation called UVC, which occurs in wavelengths from 100 – 280 nm. This radiation is less discussed because it is completely absorbed by the stratospheric ozone layer and does not reach the Earth’s surface at all. Currently, UVC presents no threat to our health since the ozone layer acts as our shield. However, this raises the issue of just how important it is to keep the ozone layer intact by minimizing the use of ozone-destroying chemicals in industrial manufacturing and transportation. Now that we know how ultraviolet light works, we can develop a better understanding of how to interact with it. Short exposure to UVB radiation helps the human body to generate Vitamin D, but it is important to practice sun safety to avoid the damaging effects. This is where SPF comes into play. It is unrealistic to heavily cover every square inch of our bodies every moment of every day so adequate protection requires the use of Sun Protecting Factor. The SPF number refers to the amount of time that skin can be exposed to full sun without getting burned. For example, an SPF 20 sunscreen would allow you to stay in the sun 20 times longer than you would be able to without protection. If your skin begins to redden after 10 minutes in the sun, application of SPF 20 would allow you 200 minutes in the sun before burning occurs. The numbers work out quite nicely when broken down to simple math, but this is all theoretical, of course. Sunscreen can easily wash off with water or sweat and it is often applied unevenly. Additionally, SPF only applies to UVB radiation. While there is no SPF that protects fully from UVA radiation, some sunscreens have extra ingredients like zinc oxide and titanium dioxide that will help block the full spectrum of UVA radiation for an undetermined amount of time. This makes sunscreen choice and reapplication highly important. Your skin is your largest organ and the protector of everything that physically constructs you and long-term damage to this vital organ is easily preventable. If that’s not reason even to slather on the SPF, I’m not sure what is. Gibson, Dr. James H. “UVB Radiation: Definition and Characteristics.” Natural Resource Ecology Laboratory. “The Best Sun Protection Plan for Rain or Shine.” One Medical Group. Retrieved May 25, 2015. “UV Radiation.” SunWise. US Environmental Protection Agency. June 2010. “UV Radiation.” University of California, San Francisco. Retrieved May 25, 2015.